The Coreblade is quite simply a highly powerful, highly capable piece of pro kit. Plug in if you dare! Typically efficient and nicely made. Tons of features to play with. Sounds and effects. Not quite as inspiring tonally as some other H&K amps (though miles more versatile). Learning curve to master it. Could the Coreblade be the most metal of metal amps ever? There's no doubt the Coreblade is a serious, professional piece of kit. The effects knobs are fiddly to get to grips with and adjust accurately at first. The sensitivity of the built-in noisegate can be adjusted from the rear panel. 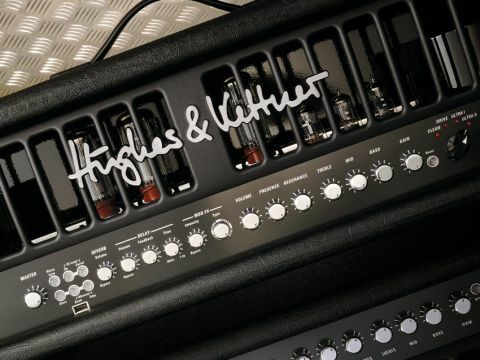 Still criminally overlooked in the search for great tone, Hughes & Kettner's range is stunning - from cost-effective solid-state designs such as the Attax, to the mindblowing exotica of the digital Zentera and TriAmp. It can also do the vintage thing, as Puretone owners will testify. So the new Pro Class flagship head, the Coreblade, has quite a reputation to live up to. A combination of valve amp and digital effects with full MIDI programmability, the Coreblade is developed from the Switchblade and aimed primarily at metallers. Does it have the tone to satisfy those tribal tattoos? Let's look closer. The first thing that's obvious about the Coreblade is its size - this is a very big head and although it's not stupidly heavy, it's rather unwieldy to carry and could use grab handles at either end. Compared to the high-end Custom range, the Coreblade's styling is understated - no glowing blue front panel here. It's extremely well put together - the sleeve is tightly fitted and covered with tough black vinyl, while the Hummer-inspired front grille is cast aluminium with the logo revealed by grinding after painting. The only other decoration is the four-cornered tribal design that's echoed on the grille cloth of the Coreblade oversized 4 x 12 cabinet. The chassis is spot-welded steel, powder-coated in thick black epoxy, and supports two large transformers. These are doughnut-shaped toroidal types which save a little on weight; mains units also substantially reduce radiated electromagnetic interference. The trade-off with mains toroidals is a big inrush of current at switch-on (over 20 amps on this head). This is something that needs to be catered for, otherwise it can stress power supply components. That's unlikely to be an issue here as the PCBs and all parts on them are well up to H&K's typically uncompromising standards. One glance at the Coreblade's control panel would scare even the most stubborn into reading the manual. Put simply, it's a fully programmable valve amplifier, with digital effects running in a side chain so they don't affect dynamic range. Apart from the global master volume, all the front panel rotaries operate a series of programmable resistor networks that capture your settings along with other switch positions and store them for recall from the included stage-board, which can access 32 banks - each with four patches - as well as feeding the Coreblade's delay with a tap tempo button. Digital effects are taken care of by a group of six smaller control knobs to the left of the panel. Modulation types include chorus, flange, phase and tremolo, which are all accessed on one knob that progresses from slow to fast speeds before switching to the next effect and repeating the speedup, while a separate knob handles the effect depth. If you thought this would make the effects tightly packed and difficult to dial in you'd be right. It's tricky to get exact speed settings, although once you've got what you want it can be stored. "One glance at the Coreblade's front panel would scare even the most stubborn into reading the manual." Delay is dealt with separately and has three controls for time (up to 1.4 seconds), feedback and level, while the final effects knob controls digital reverb. The main amp controls include presence and resonance - for fine-tuning the output stage high and low response - as well as the usual volume, gain, bass, mid and treble controls. These are all fed from a rotary switch that selects whichever one of the Coreblade's four channel voicings you want to play with: Clean, Drive, Ultra 1 or Ultra 2. There's also a boost switch that can be programmed on or off for each channel, making for a total of eight basic sounds. Between the effects and global volume controls there's a small master section that governs the patch store/recall functions, along with the external effects loop and built-in noisegate. There's also a USB port, enabling you to dump control settings to a standard flash memory key. This means pro Coreblade users can tour the world using a different amp on each continent and all they need to carry is a USB key. It's such an obvious addition we're surprised no one else has thought to include it. Any more? Well we've already mentioned the external effects loop that can be programmed in or out and series or parallel, and the intelligent noise gate that measures levels at two points in the signal path. There's also something called Tube Safety Control, which automatically adjusts bias and can handle valve failure or even a wrong valve without ruining your gig by shutting down. So, you can use EL34s or 6L6s, in any combination, and even do your own matching using a clever function that's activated simply by pressing the recessed switch with a plectrum. The stage board is tough and demonstrates typical H&K attention to detail. You might think the grey-on-black colours appear difficult to read, but the lettering is gloss finish while the background is matt. It's actually very easy to read under any lighting condition. The board can also be phantom-powered by the Coreblade using the generously long seven-pin DIN cable. The MIDI sockets are deeply recessed to protect them - any sideways movement just pushes the metal plugs against the metal chassis. Neat touch. And, while we're on the subject, the MIDI specification is comprehensive and generous, even allowing you to control effects parameters such as delay time. The Clean channel sounds a little flat without the boost engaged. Switch it in though, and everything comes alive, with plenty of headroom, a fat bass and a snappy treble, which sounds superb with a little chorus mixed in. The Drive channel is perfect for crunch rhythm or an alternative solo tone, though it's a little too aggressive to be called vintage or classic. The two lead sounds are different, but not as much as we'd like. Ultra 1 is smoother and more tightly controlled, while Ultra 2 has a more open character with increased low-end chunk for detuners. Both can deliver extreme gain and sustain, especially with the boost engaged. Maybe an easy way to get a handle on it is to think of Ultra 1 as Euro metal while Ultra 2 is perhaps more USA-influenced, although it's noticeably more compressed than what you'd hear from Shadows Fall or Killswitch Engage, for example. That's a very specific metalcore tone that a lot of players are after right now and it takes some work to make the Coreblade do it. The Coreblade's feedback circuit - which has a lot to do with the dynamic response - gets reconfigured for each channel setting, but can't be changed independently. Because of the way the amp works, control knob positions don't necessarily reflect the actual sounds the amp is producing - rotating a knob slightly instantly puts the amp in edit mode, forcing the parameter to jump to the knob's current position. This can cause some unexpected weird effects, but it's something you get used to quickly. In context, though, these are minor criticisms - taken as a whole, the Coreblade has a huge spectrum of highly usable tones. This isn't amp modelling as despite the sophisticated effects and controls, the heart of the Coreblade is all valve. The effects are excellent too, especially the reverb and delay. This is an amazing amp. We're very impressed with it and for two grand we should be, but often amps in this price bracket fall short in one or more areas. They may have great tone, but lack in features, or build quality. The Coreblade just about manages to satisfy on all levels. Aimed primarily at touring pro players, any serious metalhead who wants real valve amp sounds, effects and programmability wrapped up in one neat box will get their money's worth. There may be some strong competition from the other side of pond when it comes down to tone alone, but as an all-in-one solution the Coreblade is going to be very hard to beat.